Inhabitots Link Roundup of the Week: Last Minute Halloween Fun! Instructables helps you brush up on your photography skills by telling you how to photograph Halloween costumes. 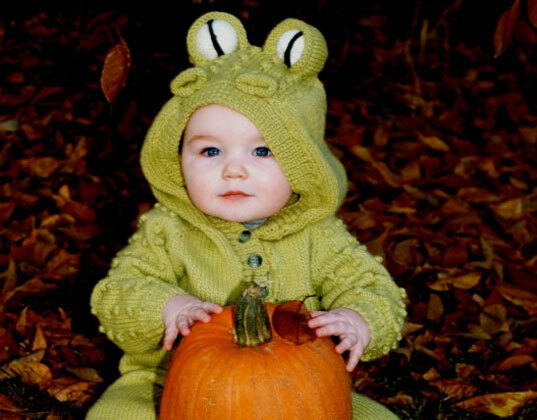 The sweet little frog above is an entry to Inhabitots Green Halloween contest — follow suit and upload your favorite snapshot of your child to enter the contest too! Ecorazzi gives us a front row seat to this year’s brilliant Village of Sleepy Hollow Pumpkin Blaze. Design Mom highlights a totally apropos costume for moms: Mrs. Incredible! Little Nummies for Little Tummies whips up some adorable monsters on a stick — a great way to ‘trick’ kids into eating fruits and veggies! Babyology features free printable Halloweenies paper dolls. Print them out on recycled paper and let the dress up fun begin! Purple Petunia Life brings acorns to life– crafting spooky acorn little people figures: witches, pumpkins, ghosts and mummies that are too cute for words! Instructables helps you brush up on your photography skills by telling you how to photograph Halloween costumes. The sweet little frog above is an entry to Inhabitots Green Halloween contest -- follow suit and upload your favorite snapshot of your child to enter the contest too!